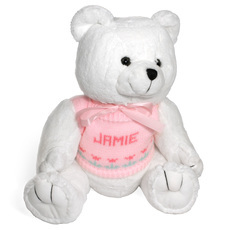 A cuddly bear wears a personalized knit sweater which features your child's name. You select sweater color, lettering color and trim design and color of bear. Bear is available in two sizes. Sweater is removable and can be hand-washed. Uppercase font only as shown. Sample shown with Brown bear in a Light Blue Sweater and Navy Lettering and Design Color with the Train design.